Me wearing a hat given to us by one of our gracious hosts in Flint, Pamela Powell, who will be present at our “Faces of the Poisoned” panel discussion. 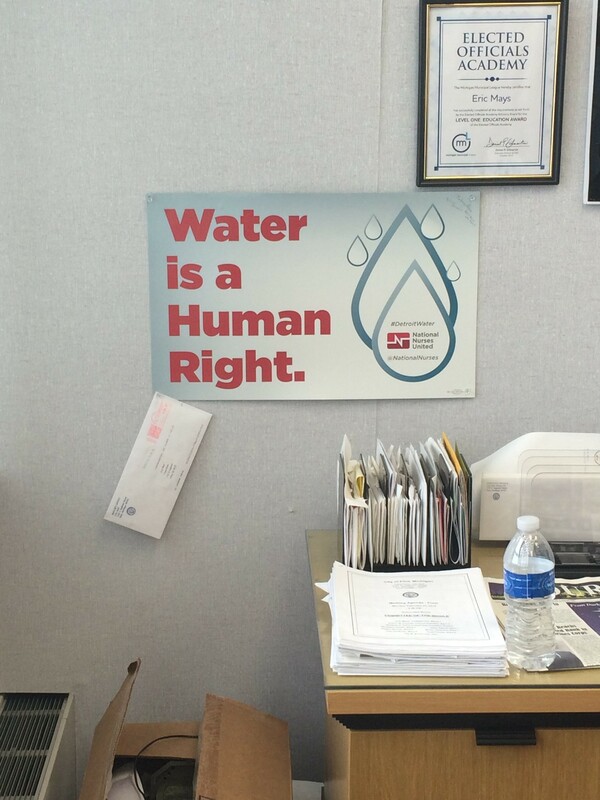 In March, I traveled to Flint, Mich. with seven fellow Roosevelt student journalists to report on the man-made water crisis that has left so many of the city’s residents in utter despair. We began our spring break by boarding a charter bus at 4 a.m. so we could make the most of every last hour of our trip. We were accompanied by our fearless leader and dedicated professor, John Fountain, and his wife, who are both seasoned journalists. We spent the majority of a 48-hour period either traveling on foot or via bus around the city, where we talked to local business owners, church members, city councilmen and community members. 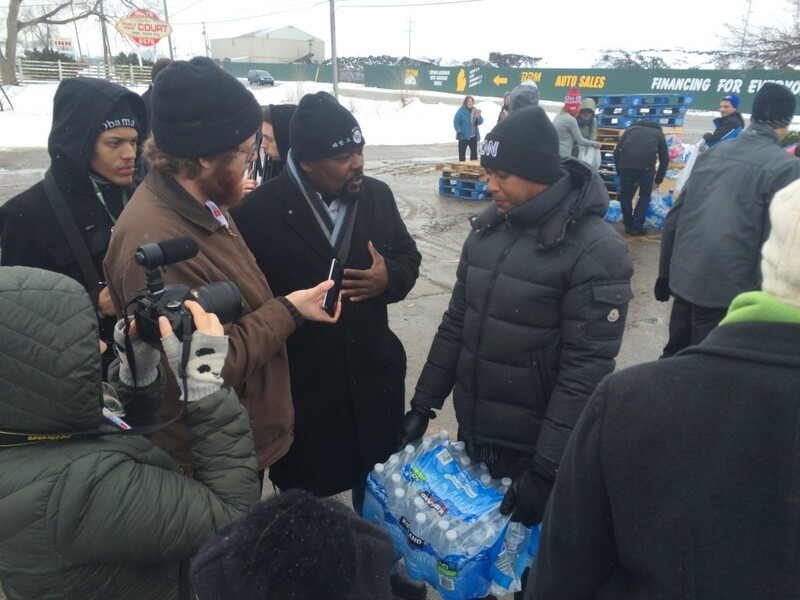 Students/Professor Fountain interviewing CNN’s Don Lemon at water distribution. It’s difficult for any of us to remember just exactly how this trip came to be, but there is one overlying motivation that stands out in our memories: we were not reading the stories we wanted to read about this tragedy. 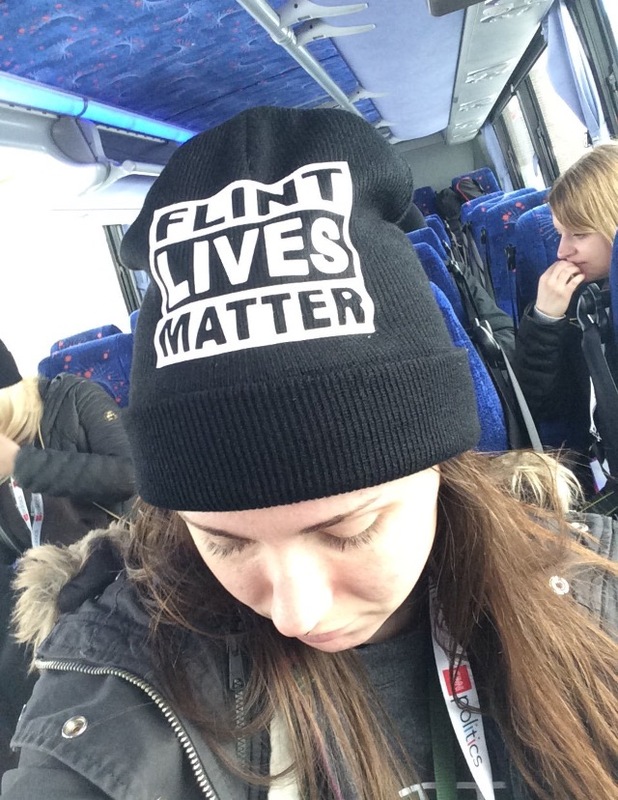 At the start of the semester, when Flint was making daily headlines, we talked a lot about it in class. Thousands of people had been poisoned with lead and other toxins as a result of government neglect. How could this happen? Who was responsible? What happens now? We followed the story as it unfolded. We read stories about lead and the government and money grabs and policy and emergency managers and the CDC, but we all seemed to notice something missing in the reporting that followed. There seemed to be some faces absent from the narrative. 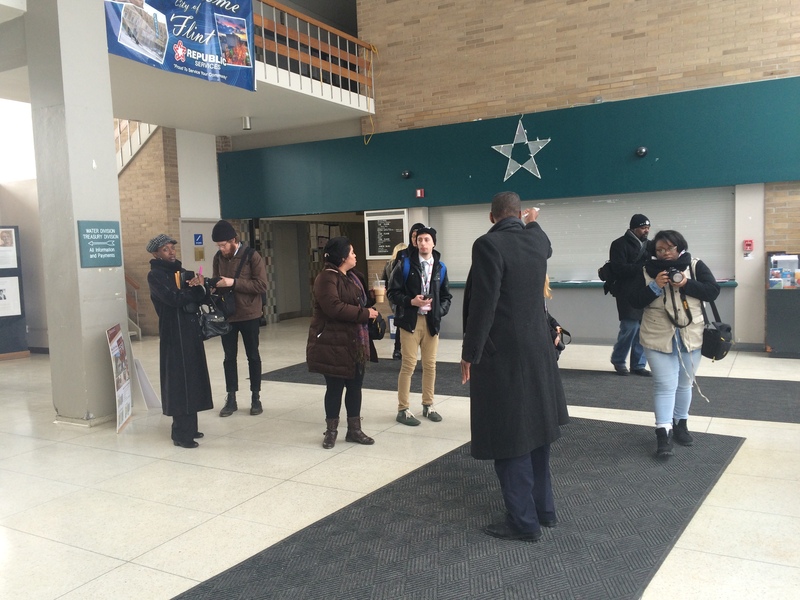 Students taking a tour of Flint City Hall with Councilman Eric Mays. Who were the victims — those who had been poisoned by their own government? Who now volunteered every weekend to distribute bottled water? Whose children were experiencing rashes and brain defects, whose elderly had expedited symptoms of Alzheimer’s? These people were our motivation for traveling to Flint. They let us into their homes, their churches, their cars. We talked to their children and their elderly family members. They showed us visible signs of their poisoning and walked us through their daily routines that now revolve around bottled water. They included us in their prayers and shared with us their woes. And while we scribbled notes and took photos, asking for insight into an unimaginable tragedy so far from our own experience, they shared with us their hopes as well. Sign from Councilman Mays’ office, which became a mantra for our trip. Their hopes that Flint will rise above this adversity and once again becoming the bustling, thriving Midwestern city that it once was. Their hopes that their faith and community will pull them through these hard times and make them stronger for what is to come. These people, who were our motivation, began to motivate us even further. I think I can speak for all of my classmates when I say we learned a lot about community, faith and resilience. We learned about the importance of storytelling and illustrating the strength that it takes to trust outsiders to tell your story. 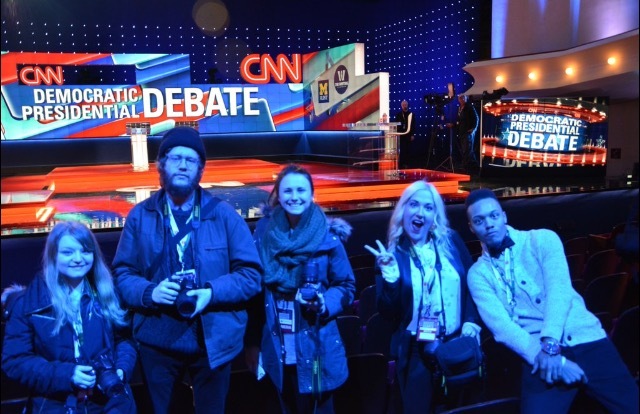 Rachel Popa, Kurt Witteman, myself, Alyson Jurgovan and Joshua Hicks at the walkthrough of the Democratic Debate. This trip is an excellent example of the ways Roosevelt University faculty embody social justice and emphasize it in their teaching. Without the help of some truly devoted professors and department heads, the stories we brought back from Flint would not have been told. After we returned home, we spent many hours creating the stories represented in our narrative work: “Flint, Faces of the Poisoned.” We have received an outpouring of support and interest from the Roosevelt community, and have worked tirelessly to produce as much journalistically sound content as we can in order to share our experiences, and the experiences of the people in Flint, with you all. Join the RU student-journalists who reported on Flint’s national water crisis at their panel discussion, “Faces of the Poisoned,” a Roosevelt University journalism convergence project. The discussion will take place Thursday, May 5, 2016 from 5-7 p.m. in Gage Gallery, 18 S. Michigan Ave. This event is free and open to the public.